ABsalute Gold – The Definitive ABBA Tribute Experience ! is a completely live ( no pre-recorded instrumentation or vocals ) re-creation of a live ABBA concert in the late 70’s and early 80’s. Each player is hand-picked for performance and personality (on and off stage). 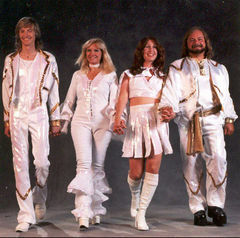 The costumes are replicas of the most popular ABBA outfits (comparative photos available upon request). ABBA details from around the world have been collected for authenticity. A four piece band and two back-up singers join the front four characters to perform the music as you see in ABBA’s live concert video footage. The stage back-drop is an replica of one of ABBA’s most famous North American concerts. The show also reveals tidbits of ABBA trivia and history. Admittedly, the choreography is enhanced due to the expectations of today’s audiences … something ABBA would likely have naturally added to suit the times. As well as performing all the ABBA hits, and the more obscure songs upon request, ABsalute Gold’s high energy show has the audience participating throughout the performance – singing, clapping, swaying, dancing in the aisles, and reminiscing about the days when they sang their favorite ABBA songs for the first time. A great all-ages, family experience.